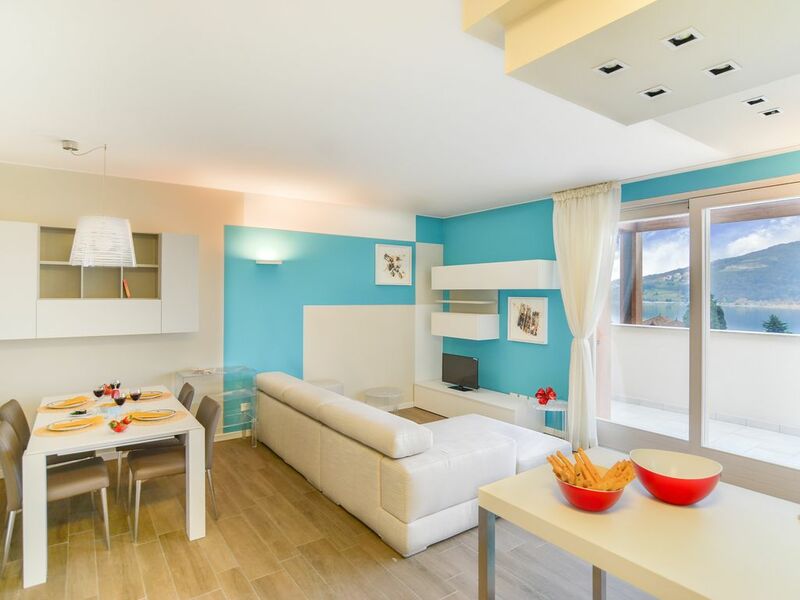 Romantic apartment with two bedrooms and two bathrooms in the quiet town of Sarnico, on Iseo Lake, housed into an elegant complex with swimming pool. The apartment, of about 80 sq.mt, is located on the 2nd floor in a residential complex recently opened with views of Iseo Lake. The complex has been built in compliance with the new regulations for environment protection and belongs to the energetic class A+: the eco-friendly materials used comprise natural wood for doors, windows and curtains poles, Sarnico stone for the outside walls. The apartment opens onto the day area: on the right of the entrance door you find the kitchenette, equipped with functional cupboards for pans and pots, induction cooktop, dishwasher, microwave and electric oven, fridge with a small freezer. The remaining of the day area is occupied by a dining table with four chairs, a comfortable sofa with big cushions, a coffee table, an armchair, a pouf and a matching carpet; the TV-cupboard is white and at each side of the piece there are nice pieces of furniture with glass doors. On the wall there are paintings with flower decorations. A sliding French door opens out onto the terrace, which offers ample views of the lake and is equipped with a table and a sun umbrella for outdoor meals. A door separates the day area from the two bedrooms, which open onto a small anteroom: the first bedroom comes with a double bed, a 2-sliding--door closet, a bedside table with lamp, chest of drawers and mirror; the second bedroom is furnished with two single beds, a 2-door closet, a bedside table, and bookshelves. The apartment has two bathrooms, both fitted with shower stall, basin, WC and bidet; one of the two bathrooms is equipped with a combo washer dryer. *The apartment also features an underfloor cooling/heating system. Please bear in mind that there are 20 steps from the ground floor to the apartment. There are NO ramps for disabled access. The complex offers a private swimming pool reserved to the guests. Area The apartment is located in Sarnico: considered as the main city of the Southern Sebino, it is the bridge between the Bergamo shore and the Brescia one of Iseo Lake. Sarnico offers both breathtaking landscapes and the opportunity to practice many sport activities such as windsurfing, rowing, water-skiing and many more. From the artistic point of view, it offers a lovely Medieval tower and the Zucchellis fortress, dating back to the XIII century, from which you have ample views of the walls and the tower. Sarnico is nowadays one of the most picturesque points of interest of Iseo Lake, still maintaining the Medieval half-circle structure of the original walls. In Via San Paolo you find the art gallery 'Gianni Bellini', comprising a collection of 150 works of art, mostly paintings dating back to the XVI-XVIII century. At about 300 meters from the complex there is a shopping center with supermarket, laundry, shops and bars.In front of the residence is the "Lido Nettuno", where you can rent beach chairs, umbrellas and have lunch at the bar. The lido offers a beach volley court, and guests can rent canoes.From Sarnico you can also take a bike path to Iseo. How to get here: From Milan:Highway A4 exit at PONTE OGLIOFollow sign to SARNICO (past the towns of TAGLIUNO - CASTELLI CALEPIO - CREDARO - VILLONGO)Once in Sarnico, at the first roundabout go straight; go past a second roundabout (there is a model speedboat in the middle of it). Go past the boat deposit, the complex is in front of you, just across the Lido Nettuno. From Brescia:Highway A4 exit at PALAZZOLO S/OFollow sign to SARNICO (past the towns of CAPRIOLO - PARATICO)Once in Sarnico, drive along the main road (bend on the right after the bridge, 300m bend on the left, straight to the first roundabout)Turn left both at the second and the third roundabout, go straight to Lovere-Predore and go past the boat deposit. The complex is on the left.